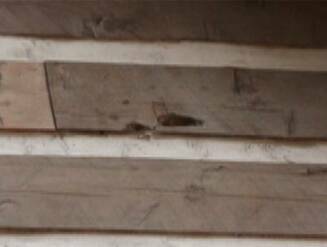 "The Dirty Little Secret Of The Log Home Industry"
Carpenter bees very often construct nests in exterior structural wood, decorative wood such as siding, fascia boards, trim, and log homes. A round hole (1/2" diameter) is chewed in the wood surface then a tunnel is bored, usually at 90 degrees to the entrance.The female will bore a channel from 6 inches to as long as 4 feet. This channel serves as a main corridor from which she will drill small chambers a few inches deep. These chambers become egg holders. She will deposit an egg, bring in some food, and then seal it off with plugs of saliva and wood fiber to ensure the egg's development. 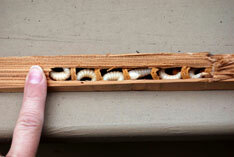 Larvae hatch and feed on the "bee bread." Usually one generation per year. Carpenter bee tunnels. Original drawing from Wood-Inhabiting Insects in Houses by Harry B. Moore, 1979. USDA, Forest Service and HUD. The tunnels may be used year after year, and lengthened each year. Damage is caused by this tunneling which eventually weakens the wood. The entrance holes introduce water and rot fungi which penetrate the wood core . Entry holes are round and generally about 1/2" in diameter. Tunnels are excavated by female bees using their powerful mandibles and nests are provisioned with pollen which feeds the larvae. Softer wood such as pine, cedar, dead standing and fir is generally selected and surfaces in direct sunlight, as compared to shaded areas, are preferred for nesting sites. 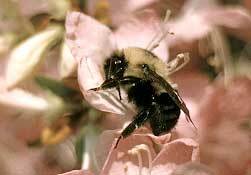 Carpenter bees live in colonies in trees like cedar, redwood, and pine. Carpenter bee's are a major log home insect! 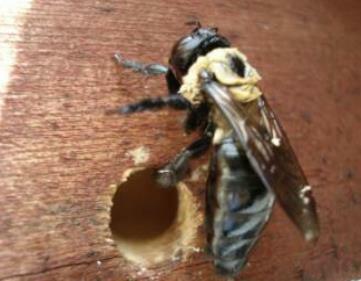 Carpenter bees "Xylocopa spp" (see photos above) are large, colorful wood-boring bees. Most people look at the 1/2 inch hole and don't give much thought and think that by plugging the hole the problem is solved. We'll think again, your problems are just starting! Approximately 98% of all log home manufactures based in the United States use types of Pine and Cedar; White Pine, Southern Yellow Pine, Douglas Fir, Standing Dead Engleman Spruce, White Cedar, Western Red Cedar and the list goes on. What were going to reveal affects all the manufactures that supply the different types of Pines and Cedars. Now you can understand why this is not discussed by the log home company's or the log home magazines who's revenue comes from the log home company's who supply the products listed above. They make up to 99% of the advertising revenue in their magazines and log home shows. We're going to show you what the Pine & Cedar companies don't want you to know, the truth ! Not only does the tunneling structurally damage the wood, that is least of the problems. The female fills the tunnels with larvae, food product and saliva also introducing water and rot fungi. As the groups of larvae mature they produce liquids and feces in the tunnels. 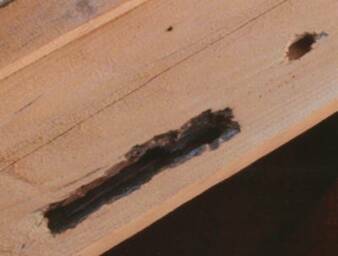 This concoction is the silent unseen problem penetrating the wood core and causing the wood to rot from the inside out. You as a customer are never aware of the destruction that's happening to your home. 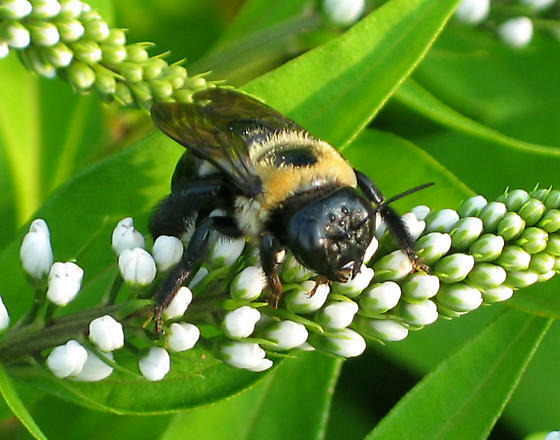 Carpenter bee larvae are noisy and tend to attract woodpeckers, Blue-jays, Crows and many other bird species who will drill holes along the tunnels feeding on the larvae. 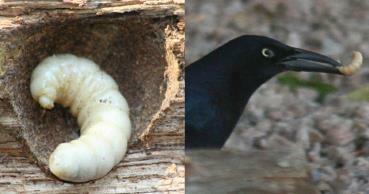 The birds also recognize the bees nesting hole which's represents food just below the woods surface. There are many companies that make their entire living from selling gadgets and chemicals to slow down, detour, fix and or repair damage caused or started by Carpenter/ Boring bee's. But not one of those single companies will stand behind the product or service they provide and give you a written guarantee to stop and or repair damage caused by Carpenter/ Boring bee's and Woodpeckers. 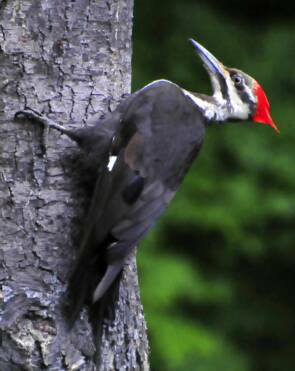 Did you know that the Pileated Woodpecker is one of the largest woodpeckers in North America and is a protected species. What do you think of the information provided on this page ? Some where common sense has to come into play. What customer /potential log home buyer in their right mind once educated knowing the facts presented would allow this to happen? Don't be fooled by companies that sell chemical sprays, they just want your money. Carpenter/ Boring bee's don't eat wood like termites therefore you can spray all the poison till your blue in the face, it won't stop or kill the Carpenter/ Boring bee's. with a chemical mix called CCA. Which stands for chrome, copper and arsenic and then coated with Creosote. CCA is such a highly poisonous/toxic material that it was taken off the market to the general public January 1, 2004. The point I'm making is that the telephone line poles soaked with some of the strongest poisons known to man and it they are still infested with Carpenter/ Boring bee's and Woodpecker’s destroying the wood and feasting on the bee larvae. time and a larger pocketbook. Are you getting the picture yet? This would need to be repeated yearly (The rest of your life) if it worked! And I don't know about your family but mine doesn't need any more chemical allergy issues. Everything I have shared with you can be verified. All videos on this site where pulled off YouTube and we do not know the owners. Just as a check and balance, do your own research and get your answers from someone that's not trying to sell you a product. Call a couple major pest control company's in your area and tell them you are considering buying a log home and would they give you a yearly contract to cover Carpenter/ Boring bee's and Woodpecker's infestation control and damage repair. We're not aware of one single company that will provide a policy to cover Boring bee's and Woodpecker’s. I could go on forever on this subject, but as you can see it's pointless. It's a major ongoing problem for the homeowner that the log home industry doesn't want you to find out about. Knowledge is power, now that you know truth your able to make the best decision. Thank you for taking the time to read this article and becoming educated on the best wood choice for you and your family. And remember only Heart-Cut Cypress will give you peace of mind for generations. Not just any Cypress but Old Heart-Cut Cypress materials. Everything from logs, trim boards, headers, rafters to rails and pickets. The Old Heart-Cut Cypress is so heavy and dense that it makes it too much work for the Carpenter/ Boring bees who prefer softer woods. Based on 25+ years customer experience testimonials of using cypress we have not seen Carpenter/ Boring bee's to be an issue with Cypress. Finally, a natural solution without the use of chemicals and or poisons. If you can purchase Cypress a premium wood, the best money can buy at the cost of pine. What choice will you make for your family? This page is a must read for anyone considering purchasing or building a log home or log cabin. 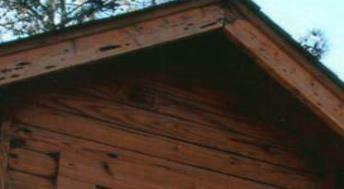 Explains and deals with Log Home Insects, Carpenter Bee's and Woodpecker's structure damage. "Dirty Little Secrets Of The Log Home Industry"
Carpenter bees also referred to as boring bees resemble bumble bees but excavate tunnels in wood to make a nest whereas bumble bees nest in soil. This nest building damages log home wood and attracts woodpeckers which in turn damage the wood even more.